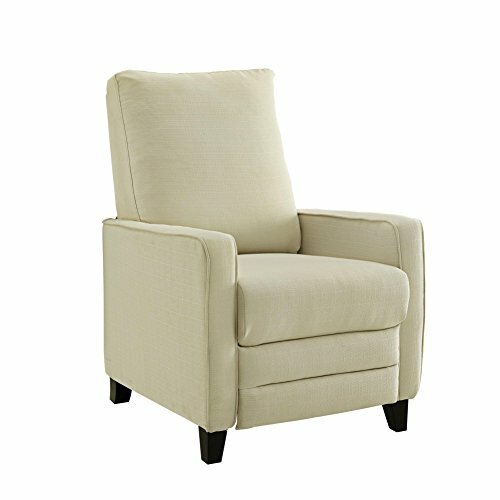 Designed to be the ideal piece, the Dorel Living gracie push back recliner is a great way to compliment your living space. It features a sturdy frame with solid wood Pyramid feet that give it excellent strength and durability, matched with style and comfort that invites you to sit back and relax. With a small footprint and a sleek silhouette, the gracie showcases great from every angle because there are no levers to spoil the look. To raise the footrest, simply lean back and recline the chair with ease thanks to the smooth push back mechanism. The updated track arm design makes for an elegant profile, while the large padded seat and back will have you sink-in and enjoy the comfort. Sit back in style with the sleek lines and modern style of the Dorel Living gracie push back recliner. If you have any questions about this product by Dorel Asia, contact us by completing and submitting the form below. If you are looking for a specif part number, please include it with your message.